George Hartley was born in East Keswick in 1878, the son of George and Jane Hartley. In 1881, George was living in Back Street, Collingham with his parents and he remained living in Collingham in both 1891, at Church Street, and in 1901 in Wharfedale Terrace where he was working as a servant. We believe that George may have married Beatrice Annie Beck at Woodside Church, Horsforth on the 3rd October 1904, and George and Beatrice were then living in Horsforth at the time of the 1911 census. George then appears on the electoral roll for Collingham from 1913, so the family must have moved back to Collingham from Horsforth between 1911 and 1913. Firstly, George's service number appears as either 81827 or 81287 on different forms. 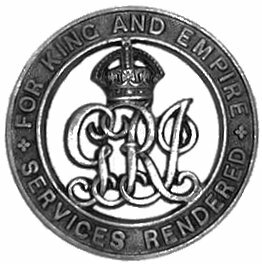 Secondly, George's medal records state that he was discharged from service on the 28th August 1918 and that he was discharged under King's Regulations Paragraph 392 (xvi) 2a for sickness, and was awarded a Silver War Badge along with his medal entitlement. This date is discharge would tie up with him being absent for the 1918 electoral roll. However the Silver War Badge lists George as being discharged on the 28th August 1916 and this same date appears on George's Pension card. Finally, we do not yet know exactly which units of the Royal Field Artillery George served with. At the time of his discharge he was with 5c Reserve Brigade RFA. It seems likely that George was wounded or taken ill during overseas service, that he returned to the UK for treatment and became a member of the Reserve Brigade, before being deemed unfit for further service and being discharged.